Guys! Operation: Eat Healthier Snacks (subtitle: Put Down the Chex Mix) is going strong three weeks into 2015. Meet these Trail Mix Bites. Impossibly easy and so, so good. When B and I trekked from California to Tennessee, we stocked the car with some serious snacks. We had protein in the form of beef jerky (ugh, taste aversion due to jerky blow out is still going strong), we had caffeine, and we had guilty pleasure carbs (coooookies ♥). We also had a huge container of trail mix. HUGE. Of which we ate multiple handfuls and then thought about chucking the container out the window somewhere in Mississippi because we were so over trail mix. Don’t worry there wasn’t any littering, though that container of trail mix has been hogging up valuable cabinet space in our teeny tiny kitchen for months now. Since I’ve been making an effort to eat more nutritious afternoon snacks to stave off hangriness, I knew it was time for a trail mix shake up. 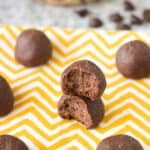 Enter these trail mix bites! All of the protein and fiber of trail mix in a new, simple, and fab variation. These trail mix bites only contain five ingredients – peanuts, almonds, raisins, dark chocolate chips, and vanilla extract. That’s it! 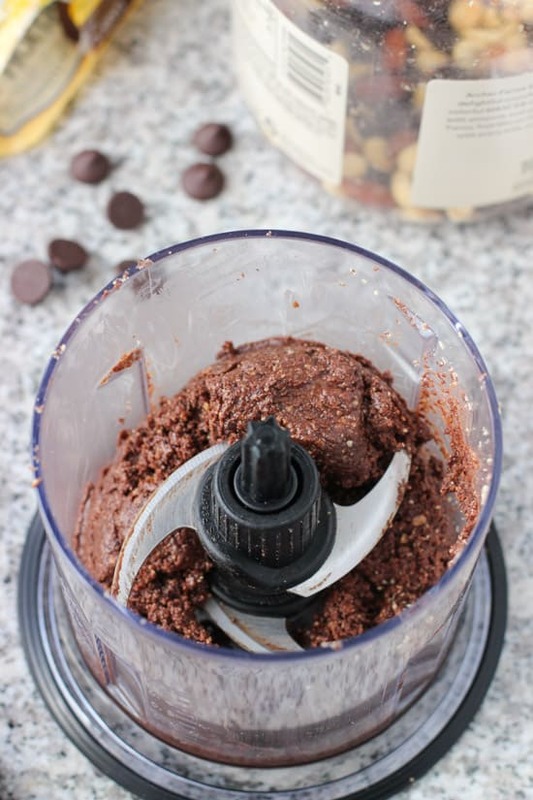 After twenty to thirty seconds in the food processor, the nuts and chocolate are ground finely and the raisins are pulverized to act as the glue holding it all together. 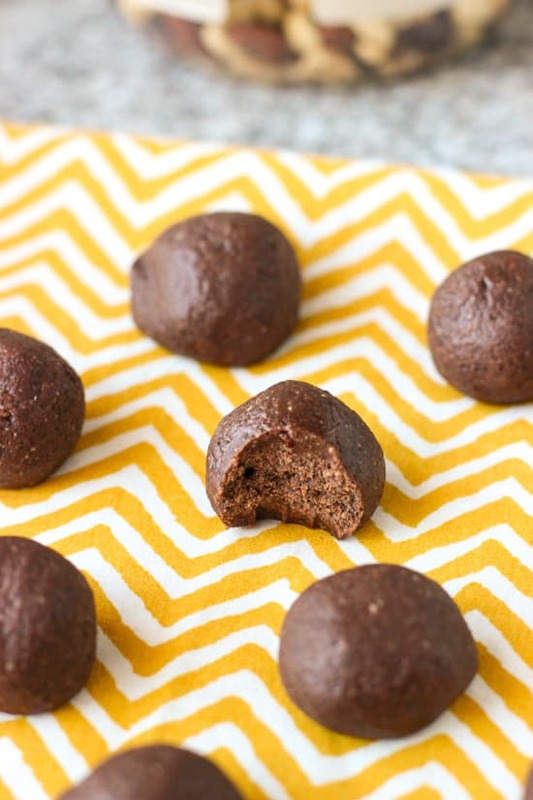 Using a tablespoon, I scooped the mixture, rolled each portion into a ball, and refrigerated them so they firmed up a bit. Five minutes of work = a week’s worth of healthy, nutrient-packed snacks. To make things even easier, I used a cup of our never-ending trail mix, which was comprised of approximately 50% peanuts, and equal parts almonds and raisins. Once upon a time our mix also contained M&Ms and dried cherries, but (real talk) we ate those long ago. 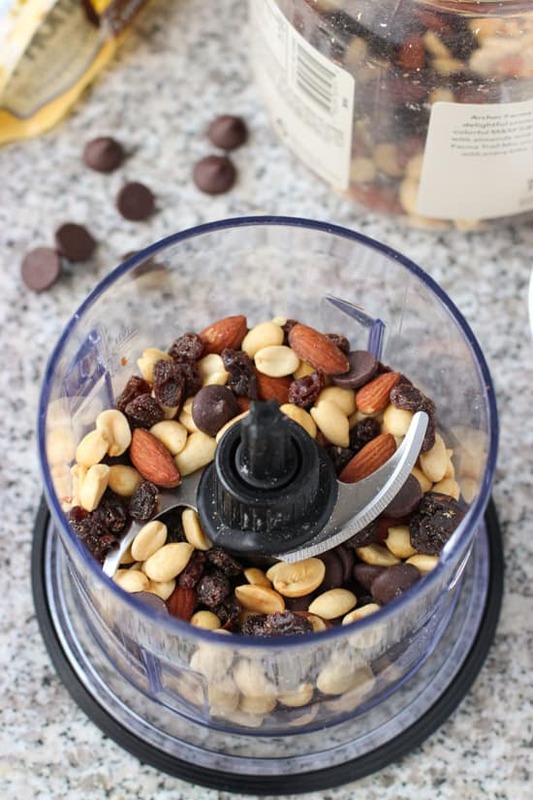 Because one of the best parts of trail mix is the chocolate component, I added dark chocolate chips to the nuts and raisins, adding a satisfying touch of sweetness to these bites. Feel free to use a premade trail mix for these bites to suit your preferences, keeping in mind the raisins are important as a binding ingredient. And one of the best things about them? While I keep these bites in the refrigerator at home, they’re able to be kept at room temperature for at least a few hours and still retain their shape and consistency. 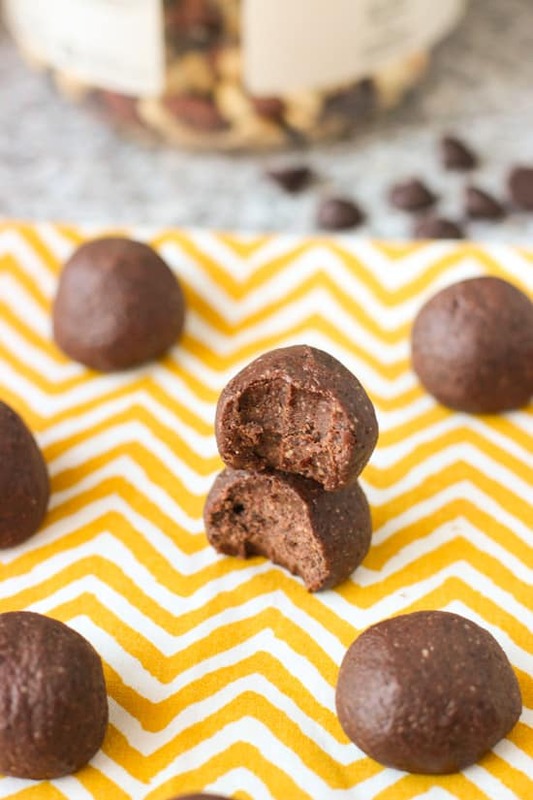 Healthy work snacks that’ll actually make it through the work day? Perfection. 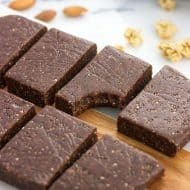 Trail Mix Bites are impossibly easy snacks! Great to use up what you have on hand. In the bowl of a food processor, add all ingredients and process for 20-30 seconds, or until mixture resembles a cohesive, formable dough (see picture in post for the consistency you're going for). Let mixture cool off for a few minutes if it's warm. Roll approximately 1 tbsp of dough into a ball and place on parchment paper. Repeat for the rest of the dough. Refrigerate bites for at least 20 minutes before serving, or until firm. 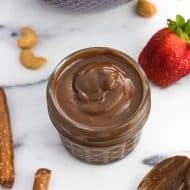 You can use premade trail mix containing nuts, dried fruit, and chocolate in place of the peanuts/almonds/raisins/dark chocolate, keeping in mind the general ratio of nuts, dried fruit, and chocolate. These bites are best kept in the refrigerator, though they can withstand at least a few hours at room temperature and still retain their shape and consistency. The nutritional info is an estimate for using roasted, unsalted peanuts and almonds. The values will vary depending on the types you use. Psst – hi friends! Do you see that swoopy looking “Y” in the orange box sitting pretty between Facebook and Twitter to the left (or below)? That’s Yummly, a recipe browsing, saving, and organizing website. You can search tons of recipes efficiently by using as many (or as few) filters as you like, and and you can even set your taste preferences so the Yummly fairies can hook up you with other recipes that are just your style. Check ’em out! This is so genius! I am SO bad about picking out only what I want from trail mix, then I don’t know what to do with the leftovers! These bites look delicious! I’m also trying to snack healthier, and chocolate and nuts are my two favorite things. Great idea! So simple and so delicious! 🙂 I like that they look a little bit naughty, perfect office snacking. What an awesome idea, Alyssa! I would never have thought of this, and these look a lot more fun to eat than a handful of trail mix! haha Pinned. Simple ingredients = yummy treats. Love these. Thanks Kathy! Sometimes simple is the way to go. I love the idea of combining trail mix into bites, Alyssa! These sound perfect to take to work for a mid-morning snack. Yum! Thanks Gayle! I’ve been loving bringing these to work. Quick and easy, and they don’t scatter crumbs all over my desk! I love little bites like this!! Also perfect for before dinner when I’m haaangry and want to eat off my arm! haha These look deelicious! Thanks Ashley! I try to avoid hangriness at all costs. It’s not pretty haha. 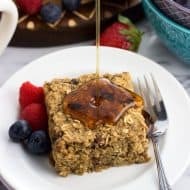 These bites totally hold me over between lunch and dinner (which is no small feat)! What a great idea!! I love this trail mix transformation. It makes me want to try it out on my picky eater sons. Love it! Shawn picks out all the m&m’s from our trail mix too! That’s cheating! You have to eat whatever you get in your handful, right? I love these trail mix bites! What a smart idea! Hahaha count us in as cheaters! 🙂 If I’m remembering correctly, my favorite combination was almond + dried cherry + M&M. Yummmm. Thanks girl! this is super creative girrrl, I’m digging it! I’m a serious work snacker and these definitely hit the spot! 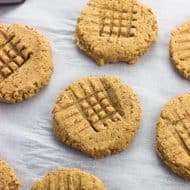 I love the short, simple ingredient list for these bites! And the fact that they contain dark chocolate, one of my favorite health foods. 🙂 Thank you for another delicious healthy snack idea!